【STRONGER SHATTER RESISTANCE】- Syncwire Nintendo Switch Screen Protector can withstand the impact of a falling 64g steel ball from the height of 3.3ft. 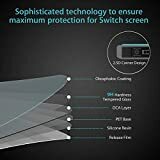 On rare occasion, a high impact may crack the screen protector, but if it ever does break it won't break off into giant sharp pieces that can cut you because it's tempered glass. 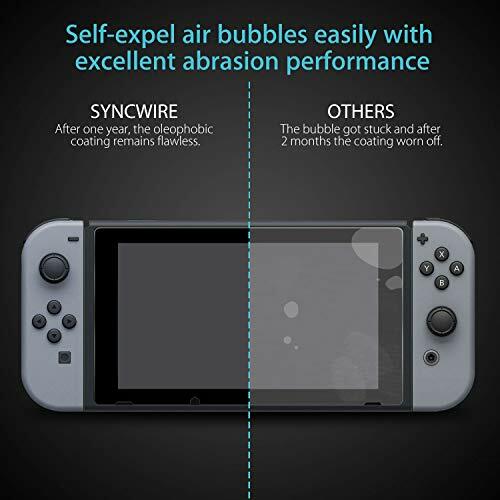 【BUBBLE FREE & ANTI-FINGERPRINT】- Syncwire Nintendo Switch Glass can self-expel air bubble when automatically bonding with the screen if you follow the installation guide and make sure the screen is 100% clean before you apply it. The oleophobic coating is thickened and has excellent abrasion performance, so fingerprints won't stay on the surface over long-term use. 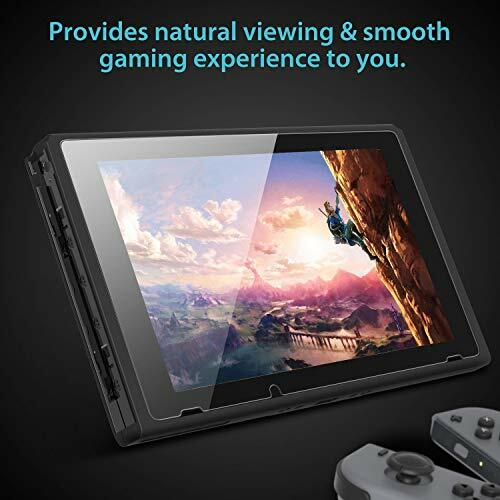 【SCRATCH-RESTSTANT & 100% TRANSPARENCY】- Syncwire Nintendo Switch Tempered Glass provides a natural viewing experience to the gamer with 100% transparency. And it provides great resilience to offer high touch sensitivity for smooth gaming with a thickness of 0.33mm. Plus, it saves your console's display from being scratched or ruined by the dock it came with. 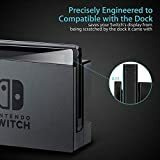 【PRECISE CUT-OUT FOR NINTENDO SWITCH】- Syncwire designs a tempered glass with sophisticated 2.5D curved edges cut-out to perfectly fit the Switch display. The film is cut precisely to the right specifications to ensure all the functionality of the Switch remains uncompromised. Plus, you won't have to worry about any little chips or cracks forming around the edges. 【FRIENDLY-INSTAlLLATION KITS INCLUDED】- The package comes with environmental-friendly installation wings, wet & dry alcohol wipes, 2 microfiber cloths, several dust removal stickers & detailed installation guide. We highly recommend you read the easy installation guide before you apply it, just make sure you will install the tempered glass smoothly, hassle-free and bubble-free. 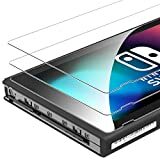 Why choose Syncwire tempered glass for your Nintendo Switch 2017? The Nintendo Switch going in-and-out of its dock can cause scratches on your screen, especially if you aren't placing it in docking position as carefully as possible. Even when you're not using TV mode to play, carrying your Switch around makes it prone to scratches, scuffs, and drops, more than ever. 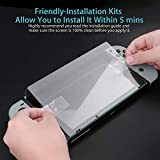 Having a protective layer like a tempered glass screen protector can help save your Switch from being scratched or ruined. To protect your beautiful display, Syncwire is offering premium screen protector, an anti-scratch and high-tension tempered glass cover that's shatterproof and extremely scratch-resistant. 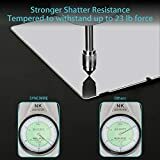 It is tempered for 4 hours and it is tested to withstand up to 23 pounds of force. 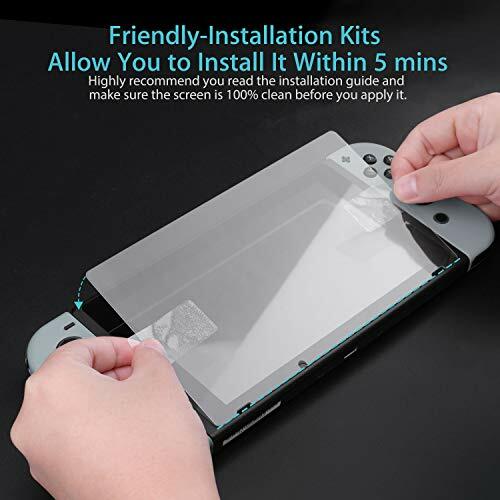 Designed to fit securely over your Nintendo Switch 's screen without any obnoxious bubbles, ultra-thin at only 0.33 mm, and a valuable ally in the fight against scratches and scuffs, the Syncwire Tempered Glass Screen Protector is a great protective accessory to keep in mind. How well does it work with Nintendo Switch? 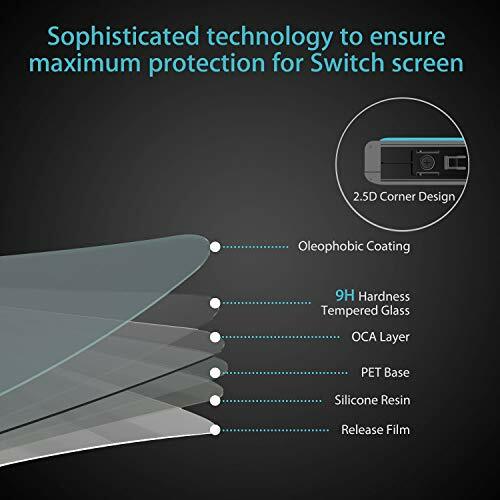 Syncwire tempered glass provides a natural viewing experience to the gamer with 99.99% transparency. And it provides great resilience to offer high touch sensitivity for smooth gaming with a thickness of 0.33mm. Plus, it saves your console's display from being scratched or ruined by the dock it came with.